The hip-hop star was scheduled to hit the stage in Dublin, Ireland and Manchester, England for his Magnificent Coloring World Tour, but he will reportedly not perform in the cities until next year (17). "It is with regret that Chance the Rapper has to cancel the remainder of his European tour due to personal reasons," reads a message posted on concert promoter MCD's Facebook page. "These are 2 shows at the Helix in Dublin and 1 show at the Apollo in Manchester. He sends his apologies for this and looks forward to returning to Europe in 2017. Refunds are available from point of purchase." The 23-year-old has yet to comment on the reports, but this isn't the first time the rapper has had to cancel his concerts. In May (16), he pulled out of a charity performance in New York after he was taken ill with an unknown condition. He also had to seek medical help prior to his 2014 Coachella set in California. 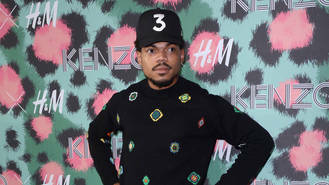 The news emerges in the same week Chance's idol Kanye West pulled the remaining dates on his Saint Pablo Tour and was subsequently hospitalised for a psychiatric evaluation on Monday (21Nov16). Chance expressed his support for Kanye, who was reportedly suffering from exhaustion, during a BBC TV appearance on Tuesday (22Nov16). "I want to extend a special prayer to my big brother Kanye West," he said. "I want to just extend this prayer and this love from all the way in Britain..."